In September, mothers and dance directors alike start calling us to place their orders for their upcoming performance of the Nutcracker Ballet held around Christmas Time. Like our Wedding of the Year Flower Girl Dress that we featured in our full page advertisements in bridal publications, these dresses are going to be featured in our ads for various dance publications including Dance Magazine. Time to think “Nutcracker Dresses for Clara” for all our dancers! June 25, 2014 / Nutcracker Party Dresses / Comments Off on Time to think “Nutcracker Dresses for Clara” for all our dancers! I know it’s still the summer but we have had a few calls about our Nutcracker Collection. My three time ballet school sent these over a little bit ago and I just loved them! In about 45 days or so we start to get very busy with our Ballet schools and soon followed by the mom’s who find out that their little ballerina got chosen for the part of Clara in the Nutcracker Ballet. 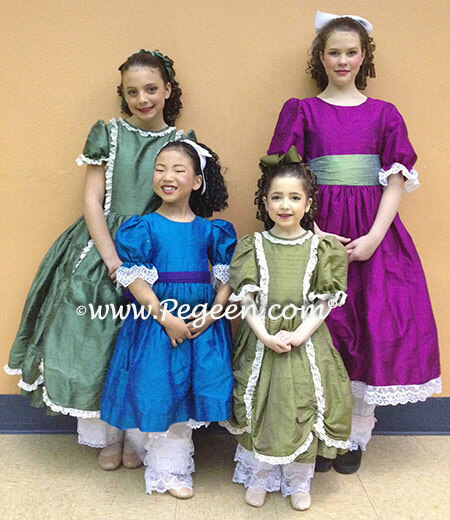 Some dresses from Pegeen’s Nutcracker Collection! her professional portrait (just above). I bet 1000$ that her parents don’t have to help her with her college essays! Mandy, that girl is going somewhere someday! 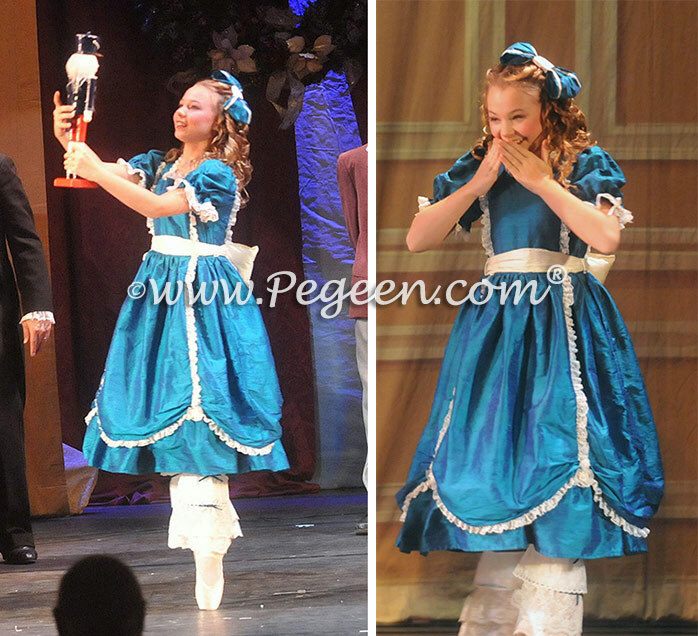 June 10, 2014 – The Design Team at Pegeen Designer Children’s Wear has added 6 new styles to their Nutcracker Collection including a silk charmeuse “Night Gown” in various colors for Clara. 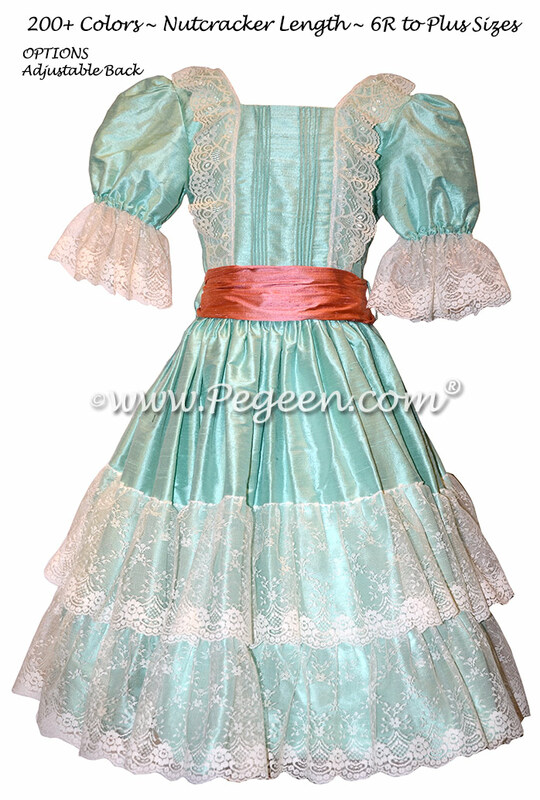 Visit the full line at Pegeen.com Nutcracker Dresses. Headed by Marg Hyland, the team starts with a sketch and for the Nutcracker, the more over the top the better. “It’s fun to do performance dresses because here we can add almost every sort of lace and trim and even go crazy with bows and the sort. Ms. Hyland should know, a former dancer herself, she gets her experience and design sense from studying dance for over 20 years, with various famous Dance Instructors including those from The Royal Ballet, Utah Dance Repertory Theater, Martha Graham. Marg started her dance training with her Aunt Marcia, the director of the Marcia Hyland School of Dance, one of the largest schools in the East Coast where her aunt was a former choreographer with the Miss America Pageant. Having received her Masters of Dance and Theater Arts in 1981, Ms. Hyland shares her love of theater in each dress she designs. “Designing for the Nutcracker Ballet is absolutely my favorite thing to do”. Typically, local dance schools will hold an audition for children to appear on stage with, at times, the most famous of all Ballet Companies. “I would liken winning an audition to NYC Ballet or ABT Company as the pinnacle of a young New York ballet student. When I was a young dancer, I remember seeing Mikhail Baryshnikov or Suzanne Farrell appearing in The Nutcracker and could not help but be envious of the student who won the part of Clara”. In the past several seasons for Pegeen’s Nutcracker Collection, Marg’s designs have appeared all over the country including the prestigious Kansas City Ballet, American Dance Ensemble and Etude’s Ballet. “I wish so much that I could have gone to all their dance performances, it’s really my favorite of all ballets. 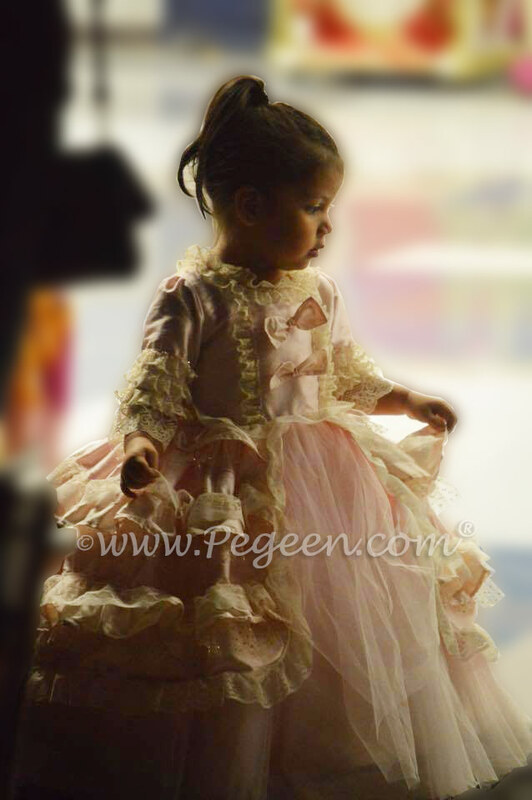 I get a thrill when my customers send photos of their daughters or sons wearing our Pegeen Designs. It’s a real treasure to me”. 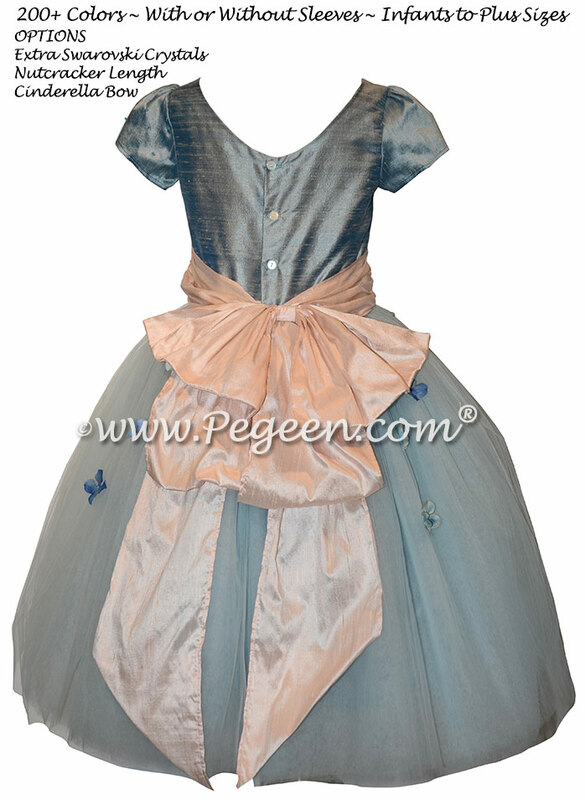 Like all Pegeen styles, the Nutcracker dresses are available in over 200 colors of silk in any combination. Additional fabrics or trims include Swiss Cotton Batiste, Silk Charmeuse and imported laces from England, Italy and France. This year’s styles includes, among others, a wonderful medley of silk, tulle, French lace and glitter tulle, and even a neck bow. 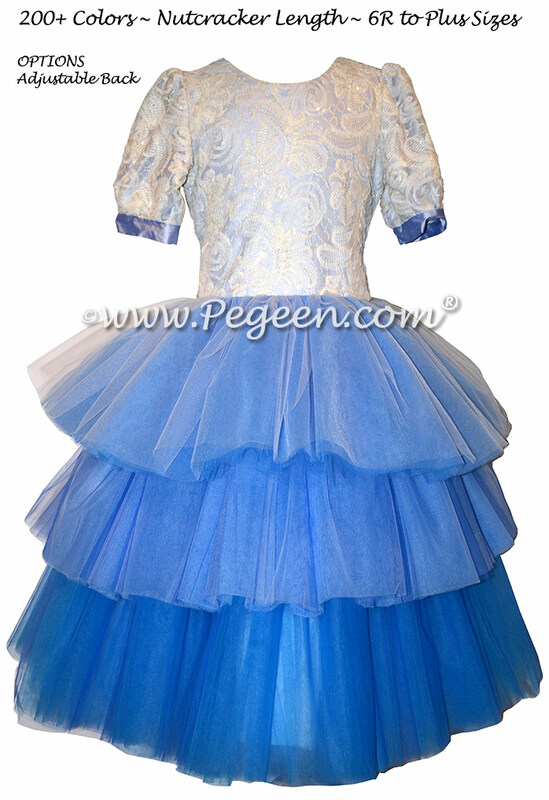 A style befitting of a princess or Clara, Style 405 is also popular for weddings and the smallest to largest of flower girl dresses speaks to someone who wants a Victorian or even Marie Antoinette style ball gown. 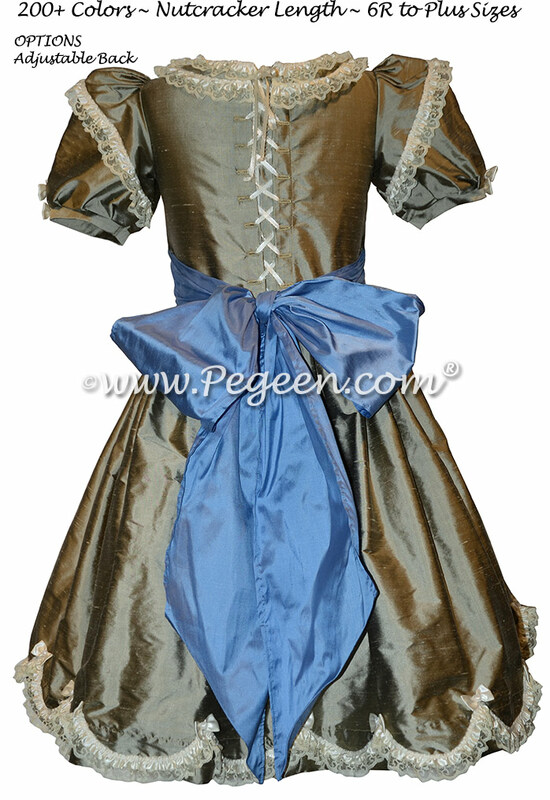 Pegeen has also introduced 4 new Clara Nightgowns ranging in fabrics from Silk Charmeuse to Silk Damask. As always, they are trimmed with ribbons but these Nightgowns are sure to please any dance instructor. The construction of which includes the ability for “Clara” to move as she dances with her “prince”. Although they range from the rather simple to the more elaborate ruffled layered look, the skirts are extra full and of course, short enough to show a ballerina’s lines. Another dress, also in tulle and silk features multiple shades of illusion tulle, delicate flowers at the neck and waistline and trimmed with real silk 1/4″ ribbon and flowers. “I particularly love this flower girl dress because as a young girl, I would envision myself pirouetting in such a dress as I attended the NYC Ballet with my mother who shared a similar love for fabrics and old laces. I think of this dress as Joan’s Dress – named for my mom who was so strong a supporter for me of my creative insides and she helped me start the company 32 years ago”. (Joan Hyland sadly passed away a few years ago from the ravages of Alzheimer ‘s disease.) Her father also recently passed away so this is the first Christmas Season they will be apart. “I got my love of theater and music from both my parents who performed professionally, so this year my newest designs are an expression of all things Joan and Bill. In fact, this is the first time that I added a boy’s style to the collection which, believe it or not, is very similar to the outfits he would wear as a young boy in the 1920’s and 30’s”. Pegeen’s latest styles for the Nutcracker are available in infant sizing (for holiday dressing) through Plus Sizes and of course, special fits for the slender ballerina. Delivery begins in Early October and completes in time for dress rehearsals starting at Thanksgiving Week. Give yourself plenty of time however because dresses are made to order and Pegeen’s creative endeavors for this ballet season are particularly sought after by many dance companies.